For this dish, I wanted to highlight cherries by using it as a braising sauce for chicken. Cherries can have both a sweet and tart flavor, which works nicely with balsamic vinegar. Combining the two to create a sauce intensifies the flavor. For the chicken, I wanted to keep it lightly seasoned but still pair with the glaze. Including a creamy component with herbed goat cheese added some contrasting textures too. Finally, to tie the entire dish together, I prepared a caramelized turnip puree. Potatoes would have been too heavy for a summer dish and using turnips is a nice alternative. Combine the balsamic vinegar, fresh cherries, mustard, honey, rosemary and thyme in a small saucepan. Bring the mixture to a boil and cook until the cherries soften up. Remove from heat and set side to cool. In a medium bowl, combine the goat cheese, fresh herbs and heavy cream to create an herbed goat cheese mixture; set aside as this will be stuffed inside the chicken breast. Prepare your chicken by creating a pocket for the stuffing. Using a sharp paring knife, make a slit into the side of the chicken breast, cutting along one edge of the chicken. The slit should be about 2-3 inches, depending on how large your chicken breasts are. To fill your chicken breasts, place 1/4 of the herbed goat cheese mixture inside the slit of each breast. Season the chicken breast with salt & pepper to taste and set aside. Prepare your skillet by heating up the oil and butter on high heat. Carefully place the chicken in the skillet and gently brown on all sides. Place the browned chicken in a baking dish and carefully pour the cherry balsamic braising sauce around the chicken. Bake in the preheated oven for 30-35 minutes. Peel the turnips and quarter them. Place the turnips in a medium sized bowl, add the melted butter and toss to coat. Place the buttered turnips in a single layer on a baking sheet and season with salt and pepper to taste. Peel away the papery layers of the garlic and cut the head of garlic in half cross-wise. Drizzle the garlic head with the extra virgin olive oil and season with salt and pepper to taste. Place the garlic inside a piece of foil and wrap up; place on the baking sheet. Roast the turnips and head of garlic in the preheated oven for 35 minutes until the turnips have nicely browned and caramelized. Remove the turnips and garlic head from the oven, Carefully open up the foil wrapped garlic head and squeeze out the garlic. Place the roasted turnips, roasted garlic, Italian parsley and thyme into a food processor. Add the softened butter and half & half, and pulse until puréed to the desired consistency. Season with salt and pepper to taste. 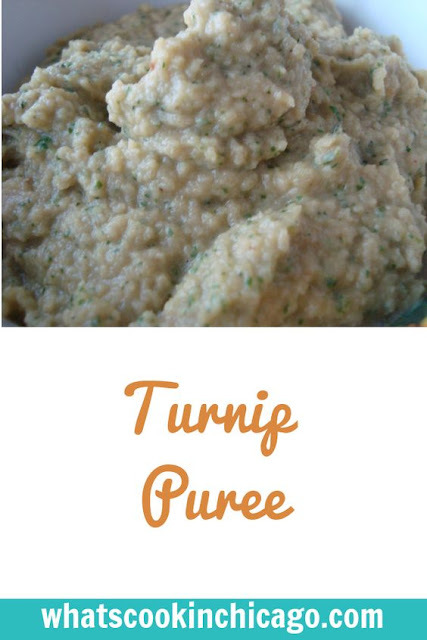 In the center of your serving plate, place a small mound of the caramelized turnip puree. Top the puree with the chicken. Pour a tablespoon or two of the glaze over the chicken. Hi! Wanted to try this with cutlets (they were on sale). Any helpful hints? Do I still cook with cherry mix for full 30-35 mins? Thanks for your help and the recipe!